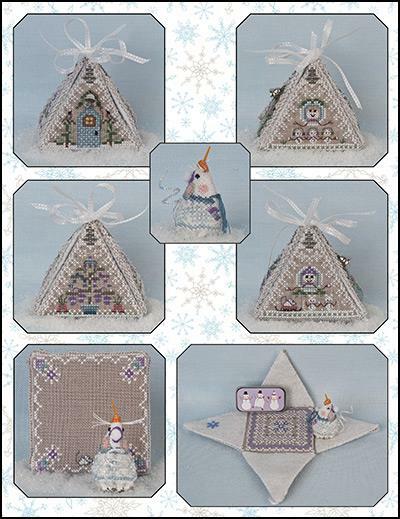 Another of Just Nan’s pyramid houses for Frosty the mouse. All four sides of the pyramid are different designs on 32 count Stone Grey linen by Zweigart. Design size is 222H x 164W. The mouse is on 32 count white opalescent linen – size 27H x 51W. Pattern includes ribbon to tie sides together at the top, felt, chipboard for base, silver crystal beads, white pearl beads, silver bell, mini white pompom, lavender blue snowflake sequin, wired string tail, antique brass button and orange toothpick nose.